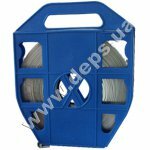 Tension clamp (anchor, wedge) PA 10 is designed to fasten and hold stretched the cables type “8” (with suspending steel wire or cord). The clamp consists of a high-strength body, two clamping captive wedges with metal teeth, and a clip of steel rustproof rope. High-strength polymer stabilized to the effect of ultraviolet rays ensures positive clamping under any climatic conditions. 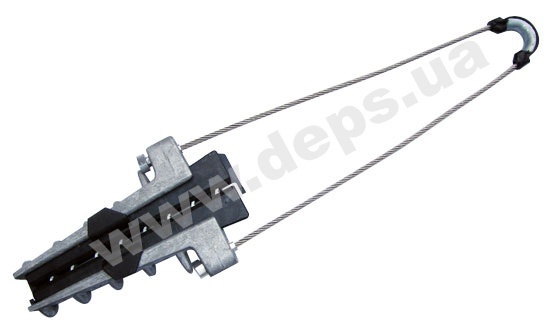 For convenient hooking by the annular fastening, the hinge can be disjoint. All the components are fastened securely and cannot be lost. 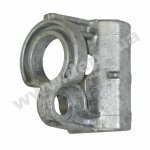 Bracket Sicame CASH is used to suspend the cable fittings on wooden, concrete or steel racks. 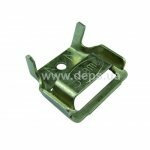 The bracket is made of aluminum alloy and is fastened on the support by one 14 – 16 mm bolt or bandage strap. Weight – 190 g. Breaking force – not less than 2000 kg.